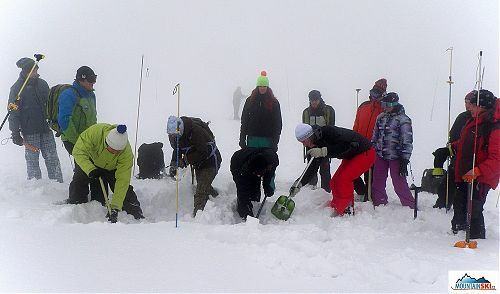 Sports Ladies have been looking for new experiences/ac­tivities: a night ski mountaineering, snow burrying & digging out process, the patience of mountain guides & ice climbing. Pieps company on the Czech market seems to capture the prevailing reluctance of Czech climbing & skiing public to systematic training. Thenfore Pieps company has decided to offer their Pipes search engines to general public with an avalanche introduction training for free. Are you already bored with classic skiing with seldom interspercing with straight jumps? Do you want to learn how to jump 360 degrees on skis? It is very easy and it is possible to jump such 360 deg jump also in freeride, see: Všeťa helikoptéroval ve Vysokých Tatrách and not only in snowpark. We spent four days (Dec 27–30, 2008) at Skialpinism Memorial at Chata pod Soliskom (1840 m). Instead of great skiing, Vseta showed us, how to jump 360 deg on his LINE skis. He was satisfied using just small snow heap under waterfall Skok.